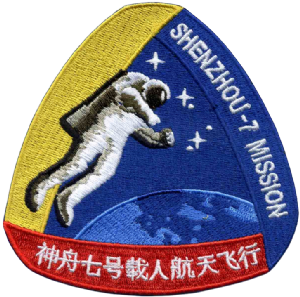 Shenzhou 7 神舟七号; was the third human spaceflight mission of the Chinese space program. The mission, which included the first Chinese extra-vehicular activity (EVA) carried out by crew members Zhai Zhigang and Liu Boming, marked the commencement of the second phase of the Chinese government's Project 921. The approximate dimensions are 100 mm x 80 mm.